Posted by admin in activity reports, Indonesia, Krakatau. At least 828 small eruptions were recorded to have happened on the volcano with 63 volcanic quakes, 434 tremors and 366 times of emission in the past six days, said Anto Prambudi, head of Mt Anak Krakatau Monitoring Post in Pasauran village, Serang district, Banten province, on Wednesday. According to him, in the past five days the volcanic quake of Mt Anak Krakatau showed a rise in its activity. In fact, the frequency of the quake and small eruptions took place in every three minutes interval. 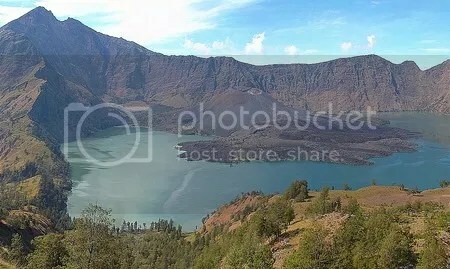 Officials at the Anak Krakatau Monitong Post in Pasauran village, Cinangka sub district, Serang district, said the volcano’s activity was on Friday marked by 182 eruptions coupled with 11 volcanic quakes, eight deep volcanic tremors, 54 shallow volcanic shocks, 44 tremors, and it also spewed smoke 29 times. But none of the phenomena posed a direct threat to human life. There are reports of some local inhabitants leaving the area with their families in alarm at the volcano’s rise in activity. At the moment the authorities have imposed a three-kilometre radius exclusion zone, but no evacuations have been officially ordered. Posted by admin in activity reports, eruptions, Indonesia, Krakatau. Quick update … it seems recent reports from local inhabitants of increased activity at Krakatau may have been correct – the alert level for the volcano has just been raised by the Indonesian authorities from Yellow (Waspada) to Orange (Siaga). Dr Klemetti has information and links at Eruptions: Alert level raised at Anak Krakatau. 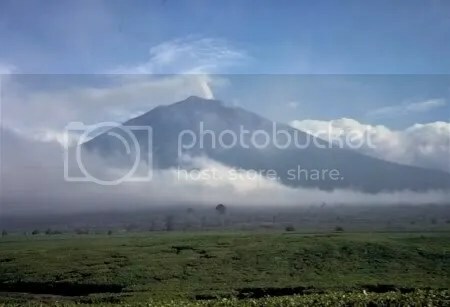 Posted by admin in activity reports, Indonesia, Kerinci, Krakatau. News of volcanoes stirring in Indonesia, one of the most volcanically active parts of the globe. Mount Kerinci, Sumatra, Indonesia. Picture by Tom Casadevall, USGS, 1987. Mount Kerinci on Sumatra, the highest volcano in Indonesia (3800 metres a.s.l.) and one of the most active, is reported to be producing small explosions, ‘discharges of dust’ and ‘repeated tremors’ and threatening the populated area at the foot of the mountain. The Kerinci Observation Post has warned local people to wear masks when going out of doors. The Indonesian Volcanological Authority alert level for Kerinci is thus far still at the second-lowest level of Yellow (Waspada). Anak Krakatau, the young volcano emerging in the Sunda Strait on the site of the famous 1883 ‘Krakatoa’ eruption, is apparently causing alarm among local people, some of whom have been leaving their homes in the belief that a major eruption is imminent. The volcano has been producing explosions and eruptions of ash, but the volcanological authorities say that the activity is not unusual and people should not panic. The alert level for Anak Krakatau remains unchanged at Yellow (Waspada). There seems to be a mismatch between what the scientists say Anak Krakatau is up to and what local people perceive: Dr Erik Klemetti has more on this at Eruptions.